What If You Had A Month To Live? I spent the last days of my Dad’s life, holding his hand, talking to him, singing hymns, and reading the Bible. I am so grateful our relationship was healed in the past years and neither of us faced this time of our life with regrets. It was about this time last year on February 8, 2018, when I sat with my Dad one evening after dinner, listening to him contemplating his future. He loved his work, probably more than anything, but he was also going to turn 80 in October, and he was thinking about retiring or at least "slowing down". As he went back and forth struggling with his future, he looked at me and with a twinkle in his eye asked “so, miss life coach, what should I do”? I laughed with him, and replied, “Dad, that is not how this works. I don’t tell you what to do; I ask you questions so you can discover within yourself, what God’s plans are for you and your future”. I was in San Diego, CA 3 weeks later, visiting my son and his family when around noon on February 26th, I got a call telling me my Dad had fallen on a job site in Miami, FL. I knew immediately; it was bad. He had been taken by ambulance to a trauma hospital and was going in for emergency surgery because of bleeding on the brain. He passed away on April 10th, a little over eight weeks after our conversation and I continue to think about that question in regards to my life and my future. What if I knew I only had a month, or 6 months or 5 years to live? What would I do differently? What would be important to me? Would I work more or less, would I hold on to anger and resentment or forgive quickly? What about my relationship with God? Would I seek him and grow our relationship or question him and his plans for my life? I have spent a lot of my past 5 years focusing on each day, each conversation, each hug, each text or phone call, realizing it could always be the last. We don't know when our time is up, or for that matter when our friends and loved one could be taken from us. God is the only one who knows the exact date and time of our death. Even though my Dad's sudden accident and death rocked my world in every way, it has taught me that I am strong and also confirmed that living in the moment is incredibly important. I don't want to miss out. I don't want to end up on my death bed with regrets. We are only given one life, and no one knows when that life will end. I appreciate every visit, every person in my life, every text, hug, and story shared. The important thing is not the knowledge of when your life will end, but focusing on what you are going to do while you are here. What difference will you make, what life will you touch, what will be important in the end? So, it's your turn to answer, "what would you do if you knew you only had a month left to live"? Have you ever had a time in your life where you felt like God didn't hear your prayer? You laid your plan out for him, telling him the best way to fix a situation, but it didn't get fixed, in fact it got worse? I've always been good at telling God exactly how things need to go “heal this person God, change this situation, restore this relationship”. But what about the times when he is silent, or he feels distant? I’ve learned over the past year that when my prayers seem to go unanswered, when it feels like God is distant, those are the times, I can look back and clearly see he was working. He may not have been moving mountains in front of me, but he was there all along, holding my hand as he walked beside me. Recently, I was looking back in my prayer journal and I read my entry from January 1, 2018. "Lord, I ask for one thing above all else, I want our relationship to grow closer, more intimate and real this year. My heart longs to know you, to love you, to be used by you. Help me to learn to trust you". I had no idea that in less than two months I would be facing one of the hardest situations in my life. My Dad had an accident while working on a job site. As a result he had a traumatic brain injury, was in a coma, on life support, and passed away six weeks later. As I look back, I see how God was faithful during that difficult time. He did draw me close in the crisis and also in the months following. Yes, through this hard time, God did answer my prayer; my relationship with him is more real and intimate than ever. And through it all, I learned to trust him and his plan. Isaiah 41:10-13 "Do not fear, for I am with you; do not be dismayed, for I am your God. I will strengthen you and help you; I will uphold you with my righteous right hand." For weeks, as my Dad lay in a coma, I sat by his bedside praying constantly for his healing. But it didn't happen. Days and then weeks went by, and it felt like God didn't hear me. I certainly didn't feel his strength; I felt weak and lost. It wasn't until I finally got to the place, where I told God “whether Dad lives or dies, you are still God, you are still good, and I will still love you” that I got to the place where I felt God's strength. 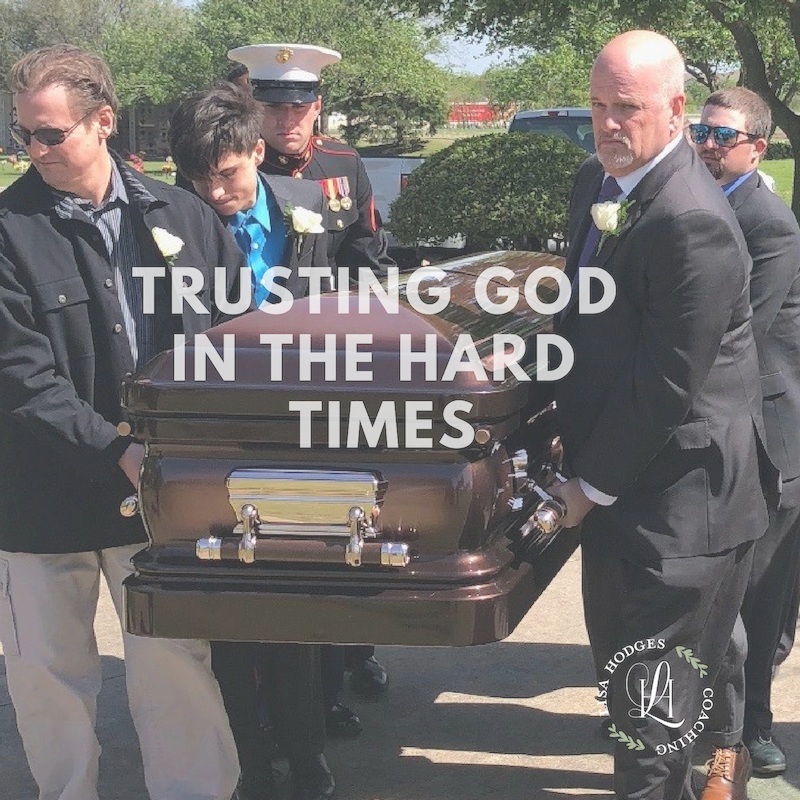 My Dad died, and the hard came, but through the hard, God was present, and he did uphold me. Looking back I can see how he worked through the situation. Time and time again, he gave me the peace and strength needed for whatever I was facing. He taught me so much and held me tight through those incredibly hard times. I learned to lean on him when I had no one else. I can trust him and know that there is no limit to what he can accomplish. But that doesn’t mean it’s always going to be easy. Without a doubt, I will face more hard times in this life. But looking back, I can see that whatever I am going through he isn’t silent, he is working. Lord, help me to trust you in every situation. No matter what I face, I know you are with me so I don't need to be afraid. You are in control, and I don’t need to do anything but wait on you. When I think you are silent or feel distant, help me to remember; no matter what, you are still God, you are still good, and I will still love you! Have you ever found yourself so occupied with all the responsibilities in your life that you forgot what is really important? My wakeup call came a few weeks ago when out of the blue, I became very sick and ended up in the Emergency Room with a fever of 103.2. The Doctor leaned over the rail of my bed and looked directly in my eyes and said “you almost didn’t make it here in time." My eyes filled with tears and my mind started spinning. What does that mean? Are you saying I could die? At that moment I started thinking about my life. I realized I have been so busy trying to keep everything balanced, that I lost sight of what is really important, my relationship with God. I have been so busy “doing” for God, I forgot that He really just wants me to “be” with Him. God wants to spend time with me, to have a personal relationship with me. Matthew 6:33 says "Seek first his kingdom and his righteousness, and all these things will be given to you as well. Seek God first and then He will show me what He wants me to “do” for Him. I need to quit running ahead of Him and just spend time with Him! Thankfully, after five days in the hospital, I am home and on a slow path to recovery. There are still no answers to what caused me to get so sick. The doctor’s are baffled because all my tests results came back negative. My confidence lies in the knowledge that He is in control, so I don’t have to be. So for now, I rest in Him when the answers don’t come. I'm not alone! If you find yourself always “doing” for God and not "being" with Him, I encourage you to take some time and seek God first. He's waiting to hold you!